The commercials and advertisements we see are almost all carefully crafted by teams of “scientists”so that they have the greatest impact possible, resulting in people believing that we NEED to buy and use these products for our lives to be complete. Here’s how Febreze was marketed and we the people have been manipulated into buying and using an unnecessary and toxic product. … “When they got back to P.& G.’s headquarters, the researchers watched their videotapes again. Now they knew what to look for and saw their mistake in scene after scene. Cleaning has its own habit loops that already exist. In one video, when a woman walked into a dirty room (cue), she started sweeping and picking up toys (routine), then she examined the room and smiled when she was done (reward). In another, a woman scowled at her unmade bed (cue), proceeded to straighten the blankets and comforter (routine) and then sighed as she ran her hands over the freshly plumped pillows (reward). P.& G. had been trying to create a whole new habit with Febreze, but what they really needed to do was piggyback on habit loops that were already in place. 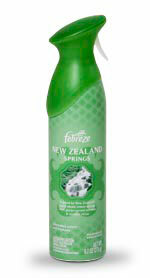 The marketers needed to position Febreze as something that came at the end of the cleaning ritual, the reward, rather than as a whole new cleaning routine. 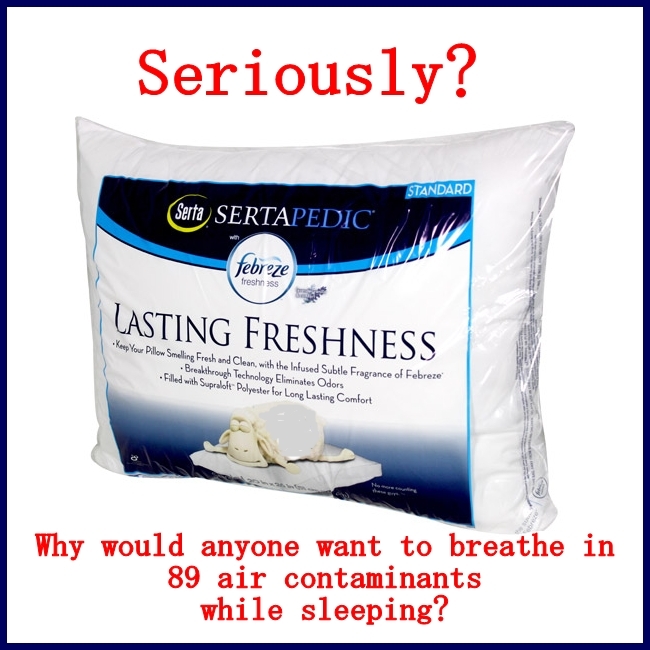 This product released 89 air contaminants. But does it even work to remove odours? Febreze is often advertised with kids or adults inhaling the chemicals and then having a stoned and distant look on their faces. It looks very much like what happens when people huff chemical products to get stoned. Most people who have MCS/ES are disabled or otherwise incapacitated by breathing air where Febreze has been used. With so many neurotoxic, carcinogenic and endocrine disrupting ingredients, is it any wonder? Doctors and environmental health specialists are recommending we avoid fragranced products, especially when pregnant, nursing or around children. The chemicals used in these products cause human and environmental harm. 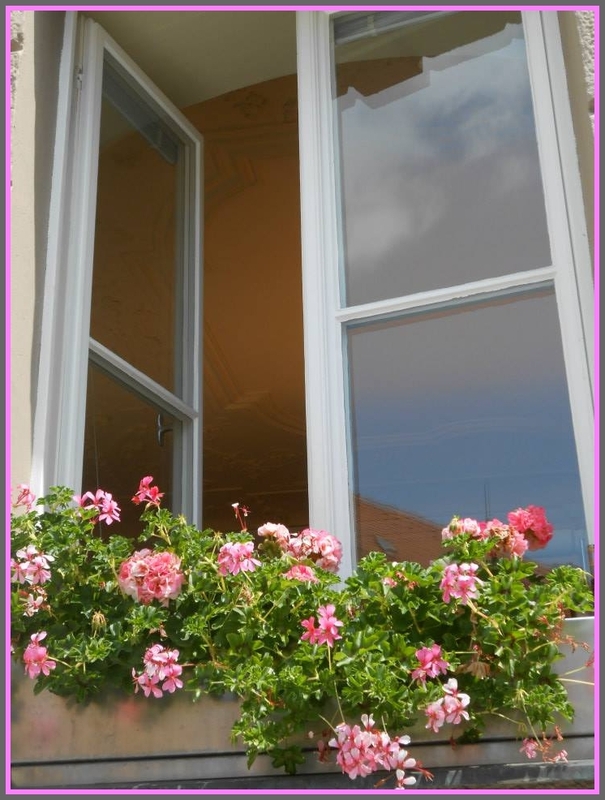 Fresh air does not smell, nor does it contain toxic chemicals. If you want some good info on how to understand the food system and choose healthier options, then you could read Food and Personal Power. We probably shouldn’t trust any industry that relentlessly advertises their products on tv or elsewhere. In that case, don’t open the window, or spray a toxic air”freshener”… You need heavy duty air purifiers until you can move! Where to, I don’t know… But we all need fresh, clean air that isn’t polluted and full of toxic chemicals. Breathing fresh, clean air and eating fresh, real food makes us smarter! This entry was posted in Chemicals, Fragrance, Health, Indoor Air Quality, Multiple Chemical Sensitivities and tagged febreze air contaminants, Fragrance, hazardous air pollutants, manipulation, MCS/ES, toxic chemicals, toxic trespass. Bookmark the permalink. I am sick of these commercials and the fact that now more and more products are advertised as having the “fresh scent of Febreze”. Air Wick National Park Collection: Um, What? If only this (getting fresh air out of a can) was possible! How I would love to spray real fresh air into my home when I can’t open the windows because the neighbors are doing laundry with toxic products, or spreading poisons in their gardens and lawns… But whoah! Spraying toxic and allergenic chemicals into my home? Damaging my brain and endocrine system now so I can get cancer later? I don’t think so! Every time I see a febreze commercial I kind of want to puke. Shared on the facebooks! I guess I’m lucky I don’t have a tv! Why do they have all kinds of anti-drug programs and then allow products onto the market that can affect people’s brains and bodies like drugs? UGH…Febreeze! The product makes me so ill.
Clean does NOT have a scent! Our neighbor uses such heavily scented laundry products, and use a lot of perfumes that I have to be careful when I open the windows or go outside. Yes, it is THAT strong that it fills the air around our house. Their cigarette smoke also mixes with the fragrances. Febreze does not clean the air, that’s for darn sure! Quite the contrary! So many of us have lost the freedom to sit outside our own homes, or even to open our windows because of toxic things the neighbours use. Women’s Voices for the Earth has a campaign to get things labelled, have you seen it? It’s terrible how toxic the fragrances and products are these days! And how they are everywhere! We do live in a new normal… And there are things we can do, for our health as well as for others. The more we tell manufacturers and retailers that we want safe products and materials (and that we won’t buy the toxic ones) the more inclined they’ll be to make the changes. We need systemic change, politicians who will create legislation that protects people instead of polluters! We need policies that protect us and are that are also enforced! Right now, only the right for corporations to make more money, no matter what the human and environmental costs, seem to be protected. We CAN demand safe products, and fair practices. And when enough of us do, they listen. But since so many of us are seeing the light, we can leave them in the dark while we move on to a healthier, happier way of living! This makes me crazy too!! It is crazy how stuff like this is legal! Corporate greed…you’d think these folks didn’t have families of their own! Do they think they are somehow immune to the adverse effects? Or that their children and grandchildren aren’t being affected? It’s hard to speculate what their relationships are with their children, etc. One thing for certain is their relationship with their bank account, because only for money would someone make these unethical choices. They can’t possibly be ignorant to the facts. Denial and belief systems (magical thinking) as well as ignorance of how cause and effect works. They may not have immediate adverse health effects, but they may develop cancer 10 years later and not be able to connect it to these products. How many people use Febreze in well ventilated areas, according to product label instructions? No doubt, there are people living with cancer today from using it ten years ago. It’s the toxic chemicals that create the smells in these products that are harmful. Febreze and other air “fresheners” do not freshen the air, they just add pollutants to make it harder to smell what’s already there. Clean has no smell.